The Complete Season Two of Star Wars Rebels was released on Blu-ray and DVD earlier this week. The three-disc Blu-ray set contains all 22 episodes of Season Two just in time for the third season to drop later this month. Here’s our review. The Episodes: I admit, I’m a huge Star Wars fan. I named my dog after a character from Star Wars. So why I don’t watch Star Wars Rebels on a regular basis is so unknown to me. The show is very good. In many ways, Rebels is on par with the movies as far as story goes, and one can tell the continuity and other aspects are so lovingly crafted with themes that are a bit darker than I would sometimes expect from a kids’ show. Yes, there are some character designs that still might fall under the “kids’ show” thing. It is a show that airs on Disney XD, after all. But the continuity, and the attention to detail, really surprised me. I was also surprised by the characters from the original films and the prequel trilogy who’d show up in Rebels; also, for some reason I thought the Clone Wars series was no longer in continuity, but it totally is, apparently. With that said: Ahsoka Tano is a character I wasn’t familiar with, having not seen much of Clone Wars, and I’m kind of obsessed with her backstory now. I also love the color of her lightsaber! Did I mention that James Earl Jones reprises the voice role of Darth Vader? Well, now I did! The other great thing about Rebels without giving anything away is that like a prime time television show, there are some cliffhangers left for what comes next. Which is not to say that this season set isn’t a complete viewing experience — it is — but it will definitely whet appetites for Season 2. The Extras: You know how I said the show is lovingly crafted? It is so much so that the people involved with making the series participated in twenty “Rebels Recon” extras, I’m assuming originally for the Web, all of which are represented here. 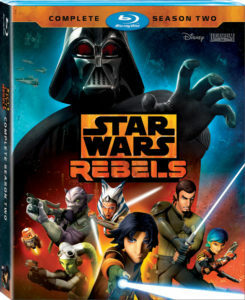 The Blu-ray contains an exclusive feature about the history between Ashoka Tano and Darth Vader that is a highlight of the set; additional extras include a “Connecting The Galaxy” feature about Rebels’ connections to other parts of the Star Wars world, including The Force Awakens. Finally, the Blu-ray also features a trailer for December’s Rogue One movie, which considering what this show is, is a very cool tie-in. Is It Worth It? I actually think I might prefer the Blu-ray presentation of Star Wars Rebels over watching it anywhere else, because there’s just so much extra material and the episodes look great. Even if you haven’t seen all of the first season, the show is very easy to follow, and like I said, some Star Wars favorites show up. Rebels is marketed toward kids but can be enjoyed by all ages, though I’d imagine younger kids might not be as into it as the stories are somewhat deep and there’s some violence. Order Star Wars Rebels: Complete Season Two from Amazon.com at a discounted price and support KSiteTV!